The world’s most sporadic blogger is back. My fiction writing has been keeping me busy, and I’m certainly not complaining. But I’ve decided to fire up the ol’ blog once more as I have a whole crop of reviews I’m excited to share. And I’m proud to start with The Other Madden by Brent Towns. The book centers on outlaw Trace Madden and his attempt to go straight. He’s in love with a good (and often hilarious) woman, and he wants to do right by her. Of course, there are complications starting with the murder of his brother. There’s also an evil land baron trying to claim the Madden Family ranch. What we get is a straight-forward, old-fashioned western with plenty of grit and a dose of heart and humor. I particularly enjoyed the character of Trace’s mother. Ma has some hilarious lines and is a hoot throughout. Brent Towns is my kind of writer. He doesn’t include a lot of filler. He offers gun-blazing tales with lots of action, and The Other Madden is no exception. There’s no filler here. This is a very lean story and it’s all the better for it. Some of the story is told in first-person perspective through Trace's narration and some is told in the third. Brent handles the shifts pretty well and it didn’t take me long to get accustomed to the format. Overall, the story is never dull, and it moves along at a very brisk clip. If you want lengthy exposition and reflective contemplation, look elsewhere. If you want a shoot ‘em up with likable characters and plenty of powder burned, give The Other Madden a shot. Solid 5 out of 5. 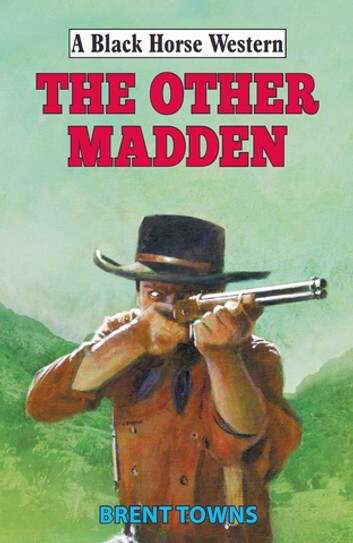 PS…Yes, the depiction of Trace on the cover is clearly modeled after John Wayne. Hey, if it’s good enough for the Duke then it’s good enough for me! I picked up Shadow Flats on a whim, not knowing what to expected. It hasn't been on the market long, and I downloaded it to my Kindle only a few days after its release. 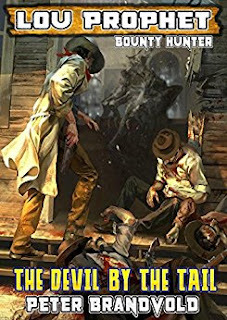 I'd been in the mood to read a good western, and thankfully Brent Towns delivered. Not only was this a good western, but it was one of the best I've read in a while. Several things make Shadow Flats unique. First of all, it is technically a movie tie-in novel. The screenplay was written by British author Ben Bridges--one of the famed Piccadilly Cowboys--and is currently (I believe) in the stages of production. Bridges is no stranger to the western genre and can more than hold his own when compared to his American counterparts. The novel adaptation was written by Australian author Brent Towns. Brent is new to me, but has several westerns available. I'll be picking those up soon. Shadow Flats has many familiar elements. 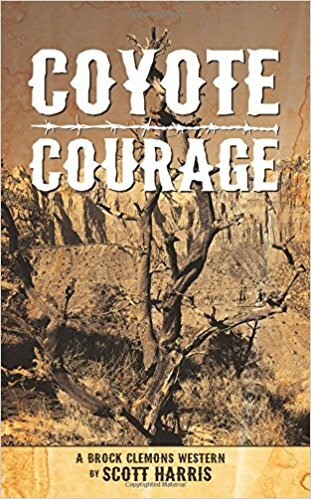 It includes a bank robbery, a haunted Civil War veteran riding the vengeance trail, shoot-outs, and a harsh, unforgiving desert landscape. Yet all of this is done in a fresh way. The story is anything but stale. This is due in part to the supernatural elements. 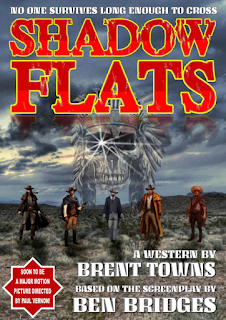 Yes, Shadow Flats falls within the "Weird Western" genre. The afore mentioned qualities are mixed together to produce a great deal of fun. It is exciting, fresh, and enjoyable from start to finish. 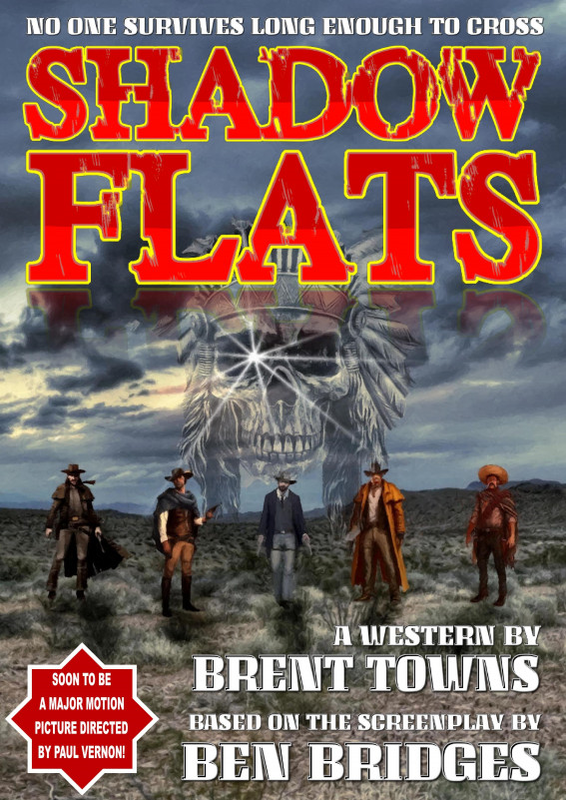 What struck me about Shadow Flats is the fact that it works as both a traditional western and a weird western. No matter which one of those you're craving, you won't be disappointed. With smooth, seamless prose and lightning fast action, Shadow Flats is a quick, easy read. It takes the reader on an incredible journey, and I for one, want more. A solid 5 out of 5. This one is highly recommended. On a side note, look at that cover! I'm not sure who did the art, but it is excellent! Y'all do yourselves a favor and grab this book. You'll thank me. 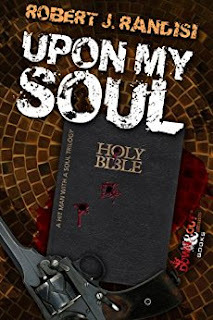 Robert Randisi delivers another winner with Upon My Soul, the first in the Hitman With a Soul trilogy. I have interviewed Mr. Randisi on this website, and I encourage you to read the entry if you have not already. Having experienced his work before, and having interviewed him for this blog, I was not surprised to find this tale to be a lean, well-written thriller. The pacing is as good as always. The plot moves along, never bogged down by filler many authors feel the need to include to pad the word count. The plot involves a hitman, Sangster (or as he is currently known as), who wakes up one day to find he has a soul. His spiritual awakening leaves him with the inability to take lives, so he quits his employment and tries to settle in for a life of peace. Of course, being a thriller, his past comes back to haunt him. I won’t spoil anything else for you. Just know there are fresh twists and turns in this highly original tale. While you may think the plot has been done before, just know that Randisi keeps it fresh, and the book is never stale. I also enjoyed the many references to other crime authors and their works. You’ll find Donald Westlake (and his alias Richard Stark) and Elmore Leonard, among others. These Easter eggs add to the fun, making this a sort of meta hitman story. It is also nice to root for the main character. Some hard-hitting crime stories have “heroes” devoid of any likable attributes. But I found myself liking Sangster as he tries his hardest to do the right thing. The bottom line is Upon My Soul is an easily consumable novel that will leave you wanting more, even though this story works as a standalone. Thankfully, there are two more books in the series, both of which I will be reading. Highly recommended. One of the things I love about interviewing great authors is the advice they dispense. For wannabe writers like myself, it’s a thrill to hear how the pros do it. So, I’ve collected some tips and tricks that have appeared on this blog. I hope it helps some of y’all. It sure is beneficial to me! He's not all that mean. In fact, he's a pretty nice guy and he was kind enough to answer some questions here on Faded Trails. Let's get right to it. Here's my interview with acclaimed and prolific author Peter Brandvold. RF: First of all, thank you so much for agreeing to this interview. What are you currently working on, writing wise? PB: I’m working on a series of four westerns featuring my half-breed hero Yakima Henry. The series is called BLOODY ARIZONA as is the first book. The second book, which I am just now finishing, is called WILDCAT OF THE SIERRA ESTRADA. I’m writing them under my Frank Leslie pen name. RF: How many books have you written as of now? PB: I lost count somewhere around 100. That includes my Longarms and Trailsmans written under pen names. So...maybe around 120 by now. RF: What does a typical work day look like for you? Do you keep certain hours when writing? Do you try to meet a page or word count each day? RF: How many days a week do you write? RF: When did you know you wanted to be a novelist? Also, when did you know you wanted to write westerns specifically? PB: I knew I wanted to be a novelist or some kind of writer early on, maybe when I heard my first story. I really saw the magic in words. I probably knew I wanted to write westerns when I was watching the great western TV series of the 70s, and reading Louis L’Amour, my first favorite western writer though I’ve gone on to appreciate many more since, because there are far better ones out there. RF: What got you interested in the western genre, be it books, television, or comics? PB: Books and television. 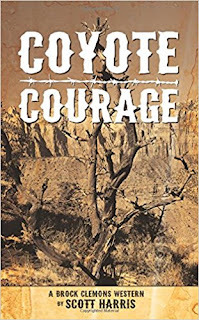 The first western novel I ever read was LORD GRIZZLY by Frederick Manfred, then I went on and read biographies of folks like Davy Crockett and then pulp westerns by Frank Gruber, Gordon D. Shirreffs, etc. I really fell for the pulp-style tales because they were so over the top and exciting. RF: I know you wrote a lot of Longarm entries. How many did you scribe when it was all said and done? RF: Did you write for any other series westerns? If you can tell which ones, please do! PB: Four Trailsman books as by Jon Sharpe. RF: I know you’ve self-published some of your recent works. Do you like self-publishing? What are some of the benefits? What are some of the challenges? PB: I like it because I’m my own boss and I can put up the books as fast as I can write them. On the other hand, coming from traditional publishing, I miss the advances. But my ebooks do very well, so I’m not complaining. RF: We often hear about the demise of the western. I know several big name publishing houses recently canceled long running series. Do you think the western will ever die? Are there enough up and coming authors and readers to keep it going? PB: The western will never die. It’s an American original and there will always be some kind of market. But all markets wax and wane. I love the western enough to ride out the ups and downs. I think there are almost too many writers out there now, and they’re somewhat muddying the western water. Too often, ebook original writers just plain do not know how to write but think they do. Readers really have to learn to discriminate so they don’t waste their time and money on some of the crap that’s getting published on Amazon right now. RF: I know about your work in the western genre, and am a big fan! I know you’ve done some weird westerns. Are there any other genres you’ve worked in or plan to work in? PB: I wrote a contemporary thriller called PARADOX FALLS. I thought it was pretty good but it didn’t sell very well. I think readers have pegged me as a western writer so that’s really all they want to see from me. And that’s fine with me. There’s really no other genre except possibly horror that I’d like to dabble in. I wrote a western horror, or “weird” western novel DUST OF THE DAMNED, and it has vampires and werewolves and even a dragon. Also, CANYON OF A THOUSAND EYES and its sequel NIGHT OF THE GHOST CAT. RF: What authors have inspired you? PB: Too many to mention. I’m a voracious reader of all genres. Well, okay, I’ll mention two wonderful western writers who’ve meant a lot to me over the years by way of inspiring me by their brilliance—Kit Prate and James Reasoner. RF: Along those lines, if you were trying to educate someone on western fiction, who are some of the authors and what are the books you’d recommend to them? PB: Man, that’s a tough one. Anything by Prate and Reasoner and possibly THE LONG COLD WIND by Giles Lutz, which Kit Prate recommended to me and is one of the best westerns I’ve ever read. It would be a good influence on someone just starting out. RF: What advice do you have for wannabe writers like myself? Is there anything you wish someone would have told you when you started out? PB: I really don’t have any advice other to write, read, write, read then write and read some more. Keep at it and, if it’s really what you want to do, don’t be deterred. If you’re deterred, then you really didn’t want it badly enough. RF: What can we expect from Mean Pete in the future? PB: All kinds of stuff including this Yakima Henry Quartet by my alter ego, Frank Leslie. RF: Thank you again for taking the time to answer these questions. You’re one of the best and your books seem to just get better and better. Thanks for all the entertainment!